For the true Boop-O-Phile, it wouldn’t be Christmas unless Betty could be a part of it. 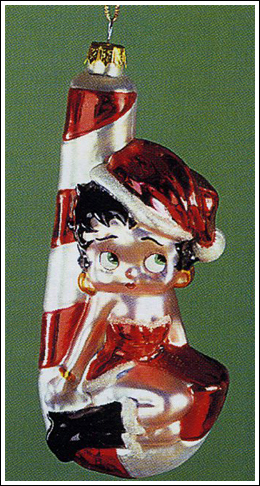 For your tree or window, or any other special display place, here is Betty a holiday sweetie, perched on a candy cane on this old fashioned glass ornament. We found the last remaining ornaments in this nowretired design, made a number of years ago in Poland. Measures approximately 6’ high and comes boxed.